Most of this approx. 13,3-Km-diameter (such as about 8,2593-miles-diameter) Unnamed Impact Crater, located approximately 265 Km (such as about 164,565 miles) to the North/West of Angkor Vallis, is engulfed in very deep shadows. The morning Sun, in fact, was VERY low in the Mercurian Sky (---> meaning that we had a High Solar Incidence Angle) when the image was acquired by the NASA - MESSENGER Spacecraft, and this circumstance is perfect to emphasize the Topography (---> the geo-physical configuration of the Surface) of the phographed location. 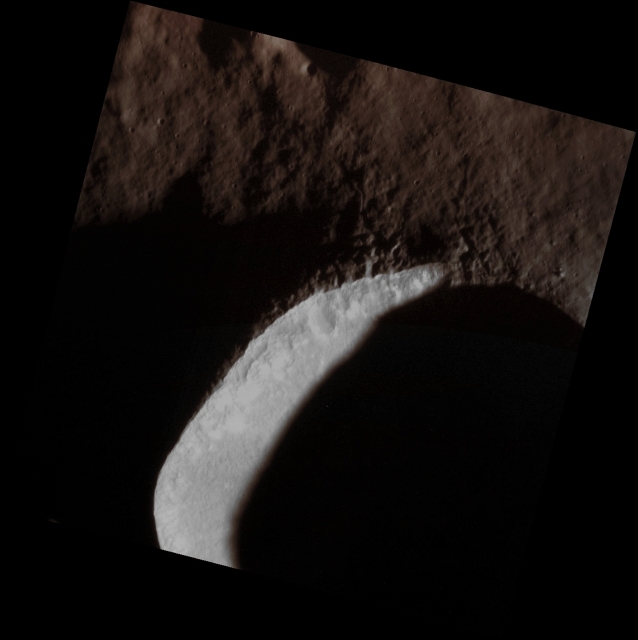 Two large Ejecta Blocks, both visible to the North of the shadowed portion of the Rim, near the right (Dx) hand side of the image, as you can see, cast relatively long shadows. The larger of these two Blocks is approximately 100 meters (such as about 328 feet) in diameter. As you should know (and we have done this always interesting "experiment", as IPF, in the past), by using simple Trigonometry and knowing the length of the Shadow as well as the Solar Incidence Angle, the height of the Block can easily be calculated and, in this case, it is approx. (~) 27 meters (such as about (~) 88,559 feet). Just out of curiosity, please note the unbelievable contrast existing between the illuminated portion of the Western Inner Slopes (they seem white, but they are, in fact, light brown-orange colored) of the Unnamed Impact Crater, in comparison with the deep and thick darkness of their portion that is still shadowed. This picture (which is an Original NASA - MESSENGER Spacecraft's b/w and Map-Projected image published on the NASA - Planetary Photojournal with the ID n. PIA 19014) has been additionally processed, contrast enhanced, Gamma corrected, magnified to aid the visibility of the details and then colorized in Absolute Natural Colors (such as the colors that a human eye would actually perceive if someone were onboard the NASA - MESSENGER Spacecraft and then looked outside, towards the Surface of Mercury), by using an original technique created - and, in time, dramatically improved - by the Lunar Explorer Italia Team. Different colors, as well as different shades of the same color, mean, among other things, the existence of different Elements (Minerals) present on the Surface of Mercury, each having a different Albedo (---> Reflectivity) and Chemical Composition.